All Hail King Bitcoin! Not. Decentralized digital currencies may have a problem: we’ve allowed them to become sorta centralized. How else can one explain why Bitcoin’s current internal discord — and its corresponding price dive — has also caused nearly every other cryptocurrency to take a proportional hit? Think of it this way: what if internal discord at, say, Tommy Hilfiger, caused the entire clothing industry to lose nearly 30% of its market cap in just two weeks? Would we not conclude that clothing production was insanely centralized — that Tommy Hilfiger had an unhealthy amount of influence which clearly threatens the entire clothing market? And that, my friends, is what Bitcoin has right now: an unhealthy amount of influence in the cryptocurrency industry (and it is an industry). Its disproportionate influence is also why so many in Bitcoin are doing irrational things right now like pushing BitcoinXT as a fork without starting a new network (I’ll explain below). 1 – Bitcoin theoretically has the potential to process thousands (or more) transactions per second. However, in its early days, a cap was placed by Satoshi himself on the amount of transactions that could be processed per block — a “block size cap” of 1MB. Satoshi said that this was a temporary anti-spam measure that should keep the blockchain small enough that new users could host it on their home computers. He further noted that the cap ought to be removed eventually. 2 – In the last three months, at least two “spam attacks” have taken place on Bitcoin’s blockchain. These involved one or more people sending tiny fractions of bitcoins at a frequency that outpaced Bitcoin’s current processing limit of about seven transactions per second. This created a backlog of tens of thousands of unprocessed transactions, some of which were legitimate and not spam. 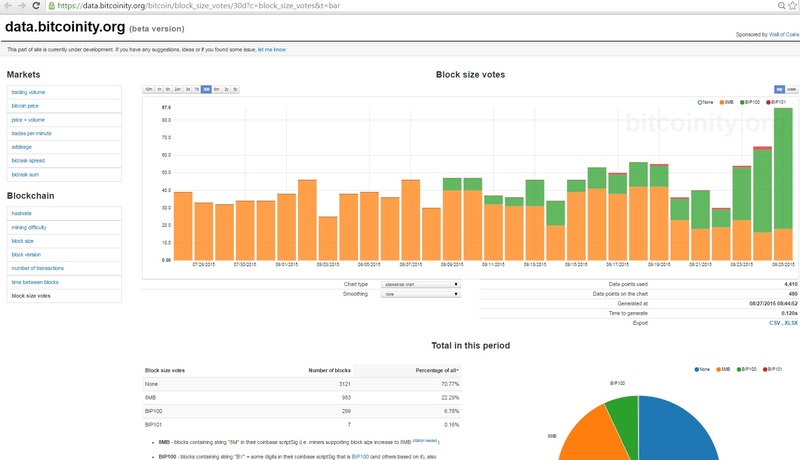 Bitcoin’s 1MB blocksize was shown to be a hindrance, giving spam the ability to create wait times, i.e. supply shortage. 3 – Discussed very little throughout the spam attacks was this fact: the spam created a minimum price at which a transaction would be processed. Since the beginning, Bitcoin’s “mining fees” — that is, the supposed “price” of getting your transaction processed in a timely way — have been set. Fixed. But during the spam attack, the fixed mining fee of 0.0001 BTC was not enough. The spammer was sending a fee of 0.0003 BTC with each of his thousands of transactions, so one needed to use a higher fee than the spammer in order to get processed within the current block. This emergent market in processing price — having already been suggested by the likes of Liberty.Me’s Justus Ranvier as an alternative to block caps — was dismissed in most Bitcoin circles. To them, Bitcoin should be all about pre-programmed functionality, not about dynamic, emergent things like changing prices. 4 – It became clear to all that if Bitcoin is to avoid more spam attacks — much less scale to be a widely used currency — the block size cap had to go. But here’s where the consensus stopped. While only a tiny minority called for market pricing of transactions to replace block size caps, the vast majority called for mining fees to remain fixed while the block size cap is gradually increased by hardcoded protocol changes. 5 – This brings us to BitcoinXT. It is a literal fork of Bitcoin which bills itself as being the chain with a bigger block size cap. Doesn’t sound too bad, right? If we can’t have a market in fees, we at least should increase that old block size limit. But the BitcoinXTers don’t honestly represent themselves. The truth is, they want more than just an increase in block size. They want a fundamental change in the way Bitcoin operates, and in the way decisions are made about how it will operate in the future. Shockingly, they’re not taking the respectable, customary, and voluntarist route of forking into a new and separate coin that supports their personal preferences. The BitcoinXTers instead want to get a majority presence on Bitcoin’s network, eventually forcing any remaining minority to either join them, or quit Bitcoin. Worst of all, Hearn has been a vocal proponent of what many consider the only way cryptocurrency could be turned into an Orwellian nightmare: “redlisting,” or the marking of every coin as either “legal” or “illegal” depending on where it’s been. And though all of us can change our ways, our backgrounds should still be considered: Hearn is believed to have been (and potentially still be) a government intelligence employee. Though he’s not been open about this, he’s made his intentions quite clear by the job title he took while working for the Bitcoin Foundation: Chair of Law and Policy Committee. State-fellator extraordinaire. Just like Obomber, I also like to be clear: I do not care if people create spycoins. I do not care if someone creates a FuckMeInTheAssGovCoin that tracks your every move, purchase, and bowel movement. I don’t care that the crypto market would ever see low-level, unattractive competitors join the fray. But here’s the problem: there currently is NOT the market of which I speak in crypto. Not when Tommy Hilfiger/Bitcoin has the power to adversely affect basically everyone. Most people are not shopping around for their cryptocoin. They’re just looking to Bitcoin as the King — the Undisputed-Market-Leader-Forever. There is no good reason for Bitcoin to be King. There is no good reason for any competitor in a market to be King — much less a market as vital as currency itself. Because when it comes down to it — all the jargon and sincerely cool innovations aside — coin projects are just businesses. It may be unavoidable and even desirable that someone has to be in charge of each one of them. That is not a problem so long as there is vibrant competition among coins. As it always does, the market would punish those who don’t serve consumers, and reward those who do. But that market in competing cryptocurrencies has to exist first. It is the only protection to be found from the chaos wrought by would-be Kings and cartels. So why not shop around? There are coin projects out there which can do things that Bitcoin doesn’t do, all waiting to serve you and court your business. After all, market is just another word for decentralization. What a wonderful article! I’ve not seen one that so succinctly sums up the current controversies. When I first heard of bitcoin I knew it would eventually fail. Not because it is a bad idea but because it is the first technology of its kind. How often is the 1st program made with all desired functions and no issues? Never that’s why eventually bitcoin will fall apart or at least not be the primary cryptocurrency that ends up being used once all the experimentation is done on other ways to do cryptocurrency. Indeed. I think what we are seeing are the beginning stages of the process of Bitcoin losing its first-to-market advantage to alternatives that have less unresolved issues. I make a similar point here. The same IT revolution enabling Bitcoin also enables efficient currency exchange markets and permits a retailer like Amazon.com to accept dozens of different currencies while advertising every product to each consumer in a currency of the consumer’s choice. Soon, phone apps will enable us to see the price of practically anything in the currency of our choice. We’ll have a universal translator for market communication. Many currencies may exist while individuals effectively assume that everyone else uses the currency of their choice. We may then switch currencies when our chosen currency is unstable or otherwise unattractive compared to competitors, not because of any “natural monopoly” favoring a single currency. Such a monopoly is no longer natural, if it ever was. Of course, states will continue to impose fiat money systems. Bitcoin hasn’t solved that problem, and I don’t see any technological solution to it, but technology may help us escape subjection to a particular state. Thanks for the heads up on BitcoinXT. Hearn’s monopoly on code changes is a little troubling, but the source is still open, and no one is obliged to adopt the new brand. If this fork is successful, then another successful fork from the Andresen/Hearns code is also possible, and the precedent seems a good thing. I don’t understand all of the extensions in XT, but faster transaction processing seems to be the goal. If the supply of bitcoin is no more elastic, most of my reservations about the system remain. The TOR policing doesn’t bother me so much. I want secure (from states), pseudonymous communication, but I’m not blind to the risks it poses. I don’t want securely pseudonymous title transfers. The forces securing property rights can and should (and will anyway) police these transfers. The funny thing is that Litecoin developers solved the spam attack problem back in 2012 by making the sender pay for sending each of those tiny amounts. This alone won’t solve Bitcoin’s current problems, but they should implement this. One can only hope that these XTers will inadvertently do some good by pushing people out of Bitcoin and into altcoins, thus causing another wave of innovation and growth. Fees are the answer ultimately, but fees large enough to discourage spam also discourage many micropayments, and fees undermine all the hype about Bitcoin transactions being “free just like email”. On the other hand, I’ve long thought that charging fees to send email is the solution to email spam. I’m not sure why Google or some other, large email provider hasn’t done it. I’d sign up and entitle anyone else using the service to charge me some advertised price for sending an email, especially if a friend could click “no charge” when receiving an email from me. Of course, the recipient should receive most of this fee. The small payments aren’t a problem if the email provider only bills or pays me after I owe or am owed more than a certain amount. The problem seems very soluble. I am not sure that this is true. I think it possible to create a cryptocurrency that modifies itself in response to the ways in which it is used in order to avoid all of the problems which can befall a currency. Strong AI might need to be created first, but that will probably happen in my lifetime. 1. BitcoinXT is not a brand new piece of software… it is simply the original Bitcoin Core software, upgraded with BIP101 (Bitcoin Improvement Protocol #101 for larger block sizes) and a few other new features, and it is up to the network of miners to choose whether they want to update to this new piece of software or not. If the supermajority of miners choose to update to this new piece of software, then XT becomes the new Bitcoin blockchain. 2. This is how the Bitcoin network was designed to work… an ingenious decision by Satoshi on how to roll out updates across a decentralized network! That is how consensus is discovered on the Bitcoin network. Simply amazing. Fair and democratic. The people actually get to vote, and their votes actually make a difference! Since the programming code of Bitcoin is 100% completely open-source, all of us can analyze the code and simply decide whether we like it enough to adopt it as our next update or not. There is no ability to be a dictator in Bitcoin — a “dictator” might try to push out an update, but if we don’t accept the update, then it doesn’t get implemented. Brilliant and beautiful. 3. Contrary to what this article states, Bitcoin XT is actually NOT a new currency (i.e. an “altcoin”). Why? Because no altcoin can EVER become the Bitcoin blockchain, no matter how hard it tries. But by Bitcoin’s very own definition, if BitcoinXT is able to become the Bitcoin blockchain, then it is absolutely 100% pure Bitcoin, plain and simple. That’s how the Bitcoin updates work! That’s how Bitcoin updates have worked in the past, and that’s how Bitcoin updates will work in the future. 4. Most of the Bitcoin industry is in favor of BIP101. There are a few vocal people who are against BitcoinXT and are trying to stifle/censor any online discussions that are pro-XT. (Terrifyingly, one college kid named Michael Marquardt aka “Theymos” controls & censors almost all of the online discussion about Bitcoin in 2 of the most highly-visited online discussion forums about Bitcoin). Many of the anti-XT people have financial interests to keep block size small (cough, Blockstream). As they say, follow the money! 2. Again, not sure what you mean here. Not sure how it counters anything in my article. I never insinuated that protocol changes can be made without majority network support. I’m accutely aware of how protocol changes happen and that’s why I wrote this article — to try to persuade the majority. 3. “Contrary to what this article states, Bitcoin XT is actually NOT a new currency.” This article definitely doesn’t state that BitcoinXT is a new currency. If you read it carefully, you’d have noticed that I very much wish it *had* been actually forked into a new currency. Then these internal disputes wouldn’t even be happening. 4. “Most of the Bitcoin industry is in favor of BIP101.” Not sure who you’re referring to, but it’s only the miners who matter in Bitcoin voting. If Bitcoinity.org’s charts are to be believed, BIP101 has very low support from miners, as you can see here: https://i.imgur.com/iJ7gQK8.jpg.